Why do we love to climb? That feeling early in the season. You just know you need to point the bike uphill. Your lungs ache and you gasp for breath. Surely it can’t have been this hard last time? Relax the arms. Loosen the grip. Head up. Corners come to you more quickly. Just you and your bike. Your heart and lungs pounding in your ears. Your pedals turn and the view opens up. Mountains soar and spirits rise. You are here in the Alps achieving your dreams. You have never been more alive. That’s why we love to climb. 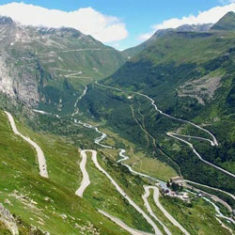 The Granfondo Gottardo features the cobbled climb of the Col du St. Gothard and the giant Furka and Nufenen Passes over a 110km course. There’s pretty much no flat bits. It’s just straight up and straight down. If your motivation for climbing is the thrill of the descent then you’ll love the rollercaster 20km+ descent from the Nufenen Pass to the finish line. Recently featured in Peloton Magazine the Alpenbrevet is truly epic. Set in the heart of the Alps the skyline is dominated by Switzerland’s famous 4,000m peaks. You’ll have plenty of time to admire the scenery as you settle in for 20km+ climbs that take you way above 2,000m in altitude. The Alpenbrevet is the ultimate test – will you have the legs for the Susten Pass? Climb three of Switzerland’s most stunning passes in the Gruyère Cycling Tour which was recently awarded the prestigious Swiss Cycling Top Tour Award for Excellence. The first climb of the day, the Mittleberg, is probably the best cycling climb you’ve never heard of. It’s got everything you want in a climb; a shaded woody valley section at a confidence inducing gradient, open pastures with a view that stretches to the horizon and stacked hairpins that urge you to climb higher and higher as you instinctively lurch out of the saddle.